Frame rate up conversion (FRUC) is a technique that generating a higher frame rate video from a lower frame rate video by inserting interpolated frames into lower frame rate video. One of significant applications is reducing motion blur caused by hold-type display characteristics (i.e. liquid crystal display). 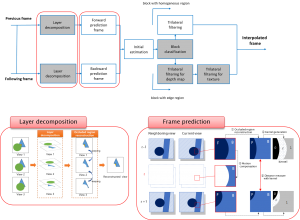 In this work, we propose novel motion estimation method for frame rate up conversion in multi-view system. Unlike block-based motion estimation, the proposed method decomposes block into multiple objects and reconstructs each occluded region which caused by occluded by another objects. Then, with reconstructed information, motion of each object is estimated.